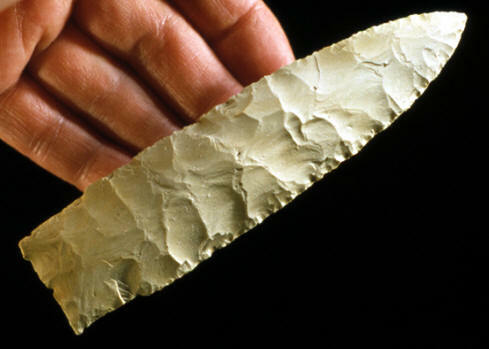 This Holland point was found several years ago in Barry County, Missouri. Some Holland points were made with fine uniform "classic Dalton style" pressure flaking. This point was made with random percussion flaking and fine pressure flaking along the edges. It exhibits two classic Holland characteristics. One is the small eared projection on the corner of the base and the other is the slight shoulders. This point is made of a tan colored chert of good quality and measures 5 1/4 inches (13.3 cm) long. Holland points date to the Early Archaic period, approximately 10,000 years ago. They were named after Warren Holland for a cache of thirteen points he found in Henry County, Iowa. Holland points represent one of the many different forms of Dalton points. The main diagnostic traits are the shoulders and, as this cast illustrates, the small eared projections at the basal corners. Bases can be either concave or almost straight like this example.